Even if you don’t have allergies, pets affect the air quality of your home. Their hair clogs air filters, dander attracts dust mites, pets track more dirt into your home, and they make your home smelly. Take a look at these four ways pets affect your air quality and what you can do about them. 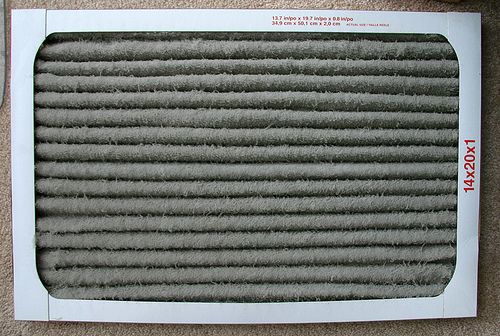 Standard air filters last anywhere from one to three months. If you own pets, you’ll have to change the air filters in your home much more frequently than people who don’t own pets because pet hair gets trapped in the filters and prevents air flow. This then affects the air quality in your home because the filter stops doing its job. Some dog and cat breeds do not shed as much hair as others, but you’ll likely deal with some pet hair in your air filters if you own a pet. If pet hair gets into your HVAC system, you’ll need to consult with an HVAC professional to clean out your ducts and system. Pet dander is tiny flecks of skin shed by dogs, cats, birds, rodents, and other animals with feathers and fur. Many people are allergic to specific types of pet dander and have a difficult time breathing when they are around it. However, pet dander also attracts dust mites and keeps them in your home longer. This compromises the air quality of your home further. The best way to prevent the problem is to remove the pet from the home. If this isn’t an option, make sure to clean often so that dust does not accumulate. Pet dander stays in your home for a long time and is tricky to control and remove. Pets track dirt, dust, pollen, and other particles into your home every time they come inside. Even if you’re not allergic to any of these allergens, they can still have a negative impact on your health if inhaled for an extended period. You may become allergic or have difficulty breathing or sleeping. You can test the air quality of your home to see what it contains. One way to control the presence of pollen, dust, and other allergens in your air is to install an air purifier. It filters air by removing harmful substances and odors. Pets are notorious for making your home smell bad. They have bad breath, smelly fur, and you must clean up after them. Litter boxes pose a particular odor problem. These odors affect the way you live and the air quality in your home. The only way to eliminate pet odors is to clean frequently. A litter box should be scooped daily, pets should be bathed frequently, and homes vacuumed weekly. It’s important to take precautions when you own a pet to minimize the effects of allergens, but you also need to be concerned about the other ways pets affect the air quality of your home. Owning a pet adds chores to your household, but the extra time and effort to keep things clean improves the air quality of your home.